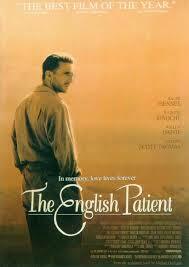 The English Patient (1996): Written and directed by Anthony Minghella. Based upon the novel of the same name by Michael Ondaatje. Starring: Ralph Fiennes, Juliette Binoche, Kristin Scott Thomas, Willem Dafoe, and Naveen Andrews. Rated R for sexuality, some violence and language. Running time: 162 minutes. The sheer originality of Fargo didn’t sate the Academy this year; they opted for yet another sweeping romance. With the win of the Kenyan-set Out of Africa eleven years earlier, the romance was relocated northward to the deserts of Egypt and Libya. Much maligned in recent years, it’s a serviceable story that disappoints after an intriguing setup. In the last days of World War II, a mysterious man has been horribly burned when his civilian plane was shot down in the desert. The film then explores the past memories of the titular “English Patient,” whose actual name is László Almásy, as he recalls them to his caretaker, Hana. Director Anthony Minghella effectively sets up the romance in Almasy’s memory—the intimacy between him and the married Katherine easily make up the highlights of the film. As in Out of Africa,there’s specificity to their relationship (their education, interests, and shared guilt of their affair) that is juxtaposed with the amazing possibility and danger of their surroundings. Unfortunately, Minghella doesn’t devote nearly enough time to the parallel relationship between Hana and Kip, a sapper for the British army. It’s easy to tell that certain relationships were better fleshed out in the novel (and possibly Minghella’s original four hour cut). Luckily, a nimble cast largely sells some hokey material. Ralph Fiennes maintains a cold aloofness while brimming with passion and ambition. Meanwhile, Kristin Scott Thomas as his lover radiates with vivacity and intelligence—it’s easy to see while Almasy falls for her. It’s a shame that the film lacks depth in its ideas—the oft-repeated ideal of a “world without boundaries” may have resonated if the film dared to explore more of the negative consequences of Almasy’s actions. It’s hard to dislike the film too much with such a wonderful cast, but ultimately it feels too safe. The expansiveness of the Ondaatje novel may have exceeded the film’s grasp.